Febooti, an automation software developer, has announced the release of the Free Edition of Automation Workshop, extending the access to its enterprise automation solution to include everyone. 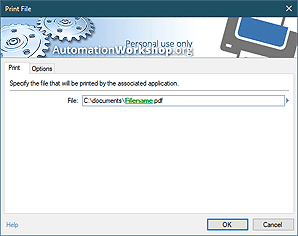 Febooti has released the no-cost version of Automation Workshop, its flagship automation software for Windows. The Free Edition is available at no charge for non-commercial use by individuals and non-profit organizations. "From the outset we have designed Automation Workshop to be accessible to most users, especially those without prior experience in automation," said Maris Bormanis, Febooti co-founder. "Now we are proud to offer our software without charge, making it truly universally available for businesses, non-profit organizations and home users around the world." Automation Workshop is automation software that can complete recurring tasks, perform repetitive operations and eliminate human errors from the process. It features a wide range of file operations from file monitoring to file copy, backup and archiving, sends email reports, supports conditional workflows and much more. Unlike traditional macro scripting software, Automation Workshop doesn't require users to learn a new programming or scripting language. Instead, the application uses intuitive triggers and actions that are easy to understand, and easy to implement. Automation Workshop works on Microsoft Windows (Vista, 7, 8, Server 2003, Server 2008, Server 2008 R2, Server 2012) 32 and 64-bit versions. Visit www.automationworkshop.org for more information. Febooti is a privately held company, based in Latvia, Europe. Evolved around the compact core of skilled IT professionals with more than 20 years of experience in software development, for the last ten years Febooti has specialized in automation solutions for Microsoft Windows operating systems. Febooti currently offers Automation Workshop as its leading business process automation software. In the news You will find press releases and media coverage of Automation Workshop and Febooti. If you have spotted Febooti on the news that are not in the list, please let us know. Automation Workshop improved both my productivity and computer reliability — unnecessary delays are effectively excluded! —Matt R.